[Via Satellite 10-21-13] After mapping variations in Earth’s gravity with high detail for four years, the European Space Agency (ESA)’s Gravity field and steady-state Ocean Circulation Explorer (GOCE) satellite has run out of fuel and the end of mission has been declared. Since March 2009, the spacecraft orbited the Earth at the lowest altitude of any research satellite. Its gradiometer – the sensitive instrument measuring gravity in 3D – was the first in space and has mapped variations in Earth’s gravity with high levels of precision. The result is an exceptional model of the geoid, which is essentially the shape of an ideal global ocean at rest and therefore critical for accurate measurements of ocean circulation and sea-level change. Although the planned mission was completed in April 2011, the fuel consumption was much lower than anticipated because of the low solar activity, enabling ESA to extend GOCE’s life. 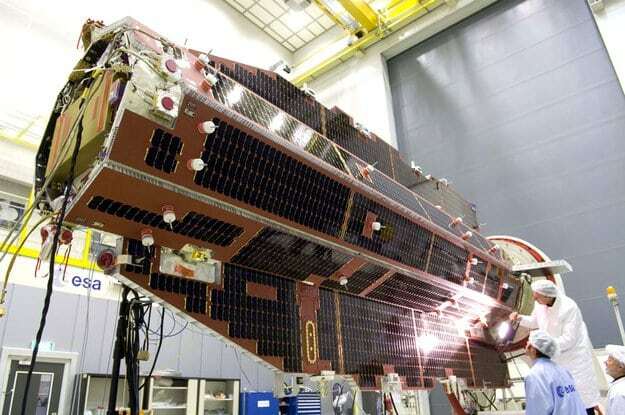 In August 2012, the control team began to lower the satellite’s orbit – from about 255 km to 224 km. Dubbed “GOCE’s second mission,” the lower orbit increased the accuracy and resolution of GOCE’s measurements, improving the view of smaller ocean features such as eddy currents. On Oct. 21, the mission came to a natural end when it ran out of fuel. The satellite is expected to reenter Earth’s atmosphere in about two weeks. Data acquisition and satellite operations will continue for about two more weeks until its systems stop working because of the harsh environmental conditions at such a low altitude. At this point, the satellite will be switched off, marking the end of activities for the GOCE flight control team. While most of the satellite will disintegrate in the atmosphere, Some smaller parts are expected to reach Earth’s surface. When and where these parts might land cannot yet be predicted, but the affected area will be narrowed down closer to the time of reentry. An international campaign is monitoring the descent, involving the Inter-Agency Space Debris Coordination Committee. The situation is being continuously watched by ESA’s Space Debris Office, which will periodically issue reentry predictions.